It was a case of Déjà Vu for The Man Bird and I as we headed back to Derby’s Cathedral Quarter. 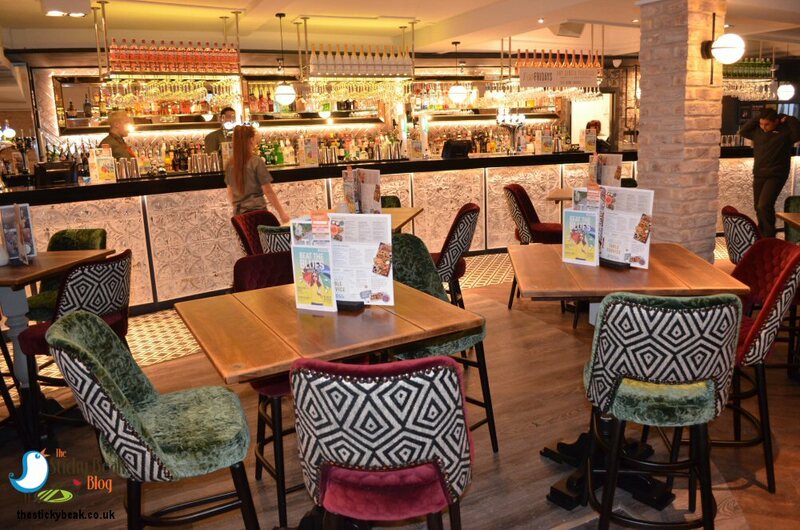 This time we were off to inspect the newly refurbished Slug and Lettuce Pub, rather than staying at the Cathedral Quarter Hotel. We were invited in to sample the food ahead of the official opening at 5pm on Sunday 5th March 2018. The concept was a “lucky dip” meal, so you picked starters and mains from giant Martini Glasses, almost like a raffle ticket! Clearly, if there was something you were intolerant to you could put it back and try again; His Nibs and I were quite excited to see what we would pull out. 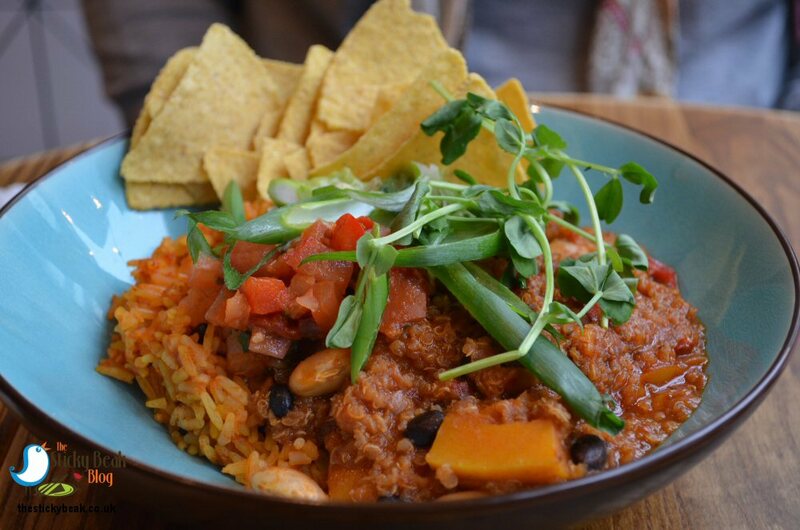 The daytime menu (which is what we would be sampling) is served until 4pm, and then the evening menu is served from 4pm onwards. For starters we got Falafel Bites (me), and Southern fried Chicken Goujons (The Man); mains were Quinoa Chilli and Smothered Chicken for me and The Boy Wonder respectively. Having got the food sorted, our lovely server brought out our drinks; we’d taken advantage of one of the many offers at Slug and Lettuce, namely 2-4-1 cocktails which is available all day every day on same kind cocktails. 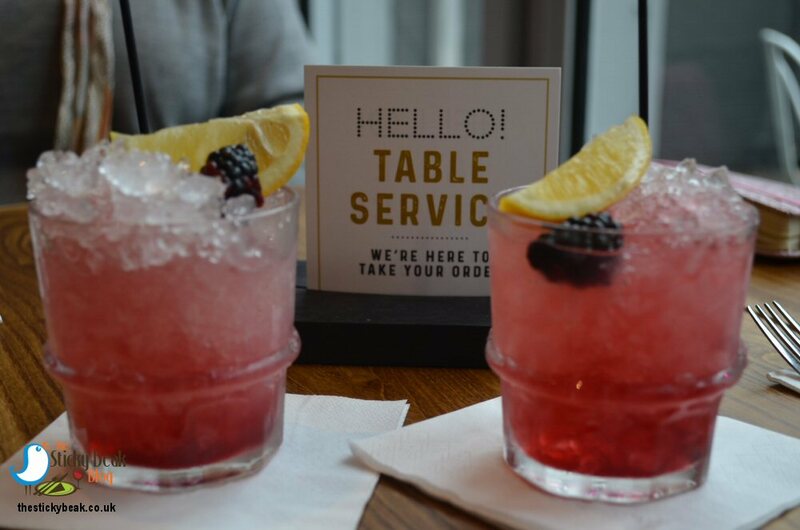 Having had a rather delicious example at Revolucion De Cuba the previous week, we had the Bramble cocktail; at Slug and Lettuce they make it with Tanqueray Gin, Lemon juice, and Blackberry liqueur. 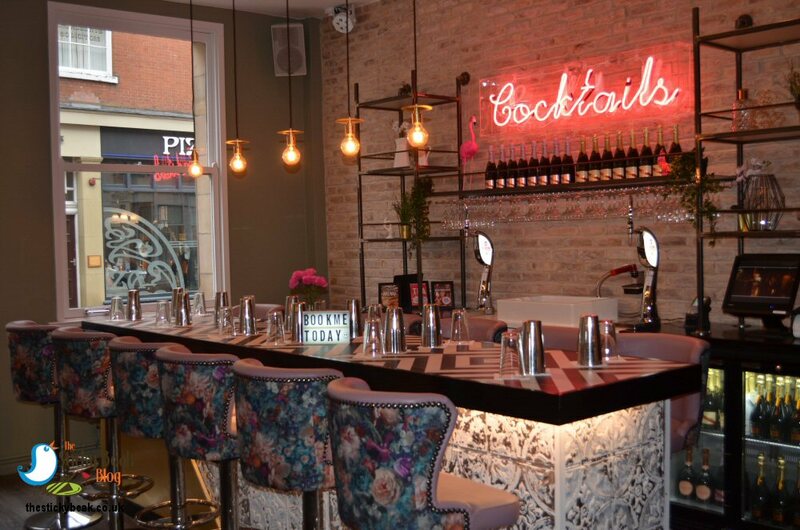 Whilst we were sipping our drinks we had a closer look at the newly re-vamped premises. In keeping with other premises in the estate, there is a light, vibrant colour scheme that has bright splashes of colour in the furnishings. I loved the Claret and Teal padded velvet chair backs and pouf style stools at the wooden tables, and also really liked the distinctive lighting in our area at the back of the venue. In fact, we were ideally placed to get the impact of the outdoor seating area - complete with faux grass! -and I was pleased to see both sides had outdoor heater lamps. Our starters came out and were both very nicely presented; my Falafel bites were in the upturned lid of a mason jar, whose body contained Pepper and Cucumber crudités. Another separate pot contained the Baba Ganoush. I’m a fully paid up, card carrying member of the carnivore society (as you know!) so I was certainly in for a different cuisine experience seeing as both my meals were vegan options! 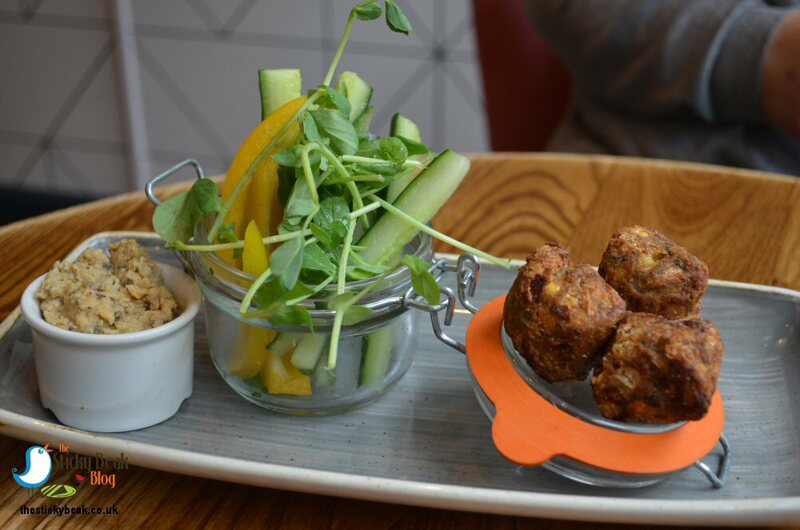 Falafels are made with spiced, mashed Chickpeas and/or other pulses and they’re then formed into balls of fritters and deep fried. 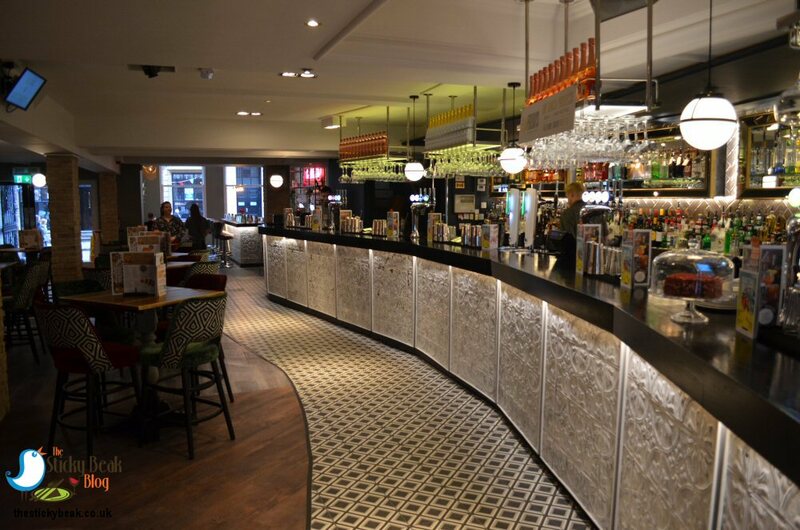 The ones at Slug and Lettuce are dinky cubes and wowsers do they taste good! I loved the texture of them too, and they were deceptively satisfying for a starter. I was dunking my fresh veggie crudités into the puréed Aubergine and Sesame seed dip that is known as Baba Ganoush, pleasantly surprised by how tasty it was - I thought it would be rather non-descript to be honest. How wrong I was! Across the table, His Nibs was happily chowing down on his Southern Fried Chicken Goujons, and they were good sized specimens it has to be said. They had a lovely crispy breadcrumb coating that wasn’t at all greasy, just lovely and crunchy when bitten into. 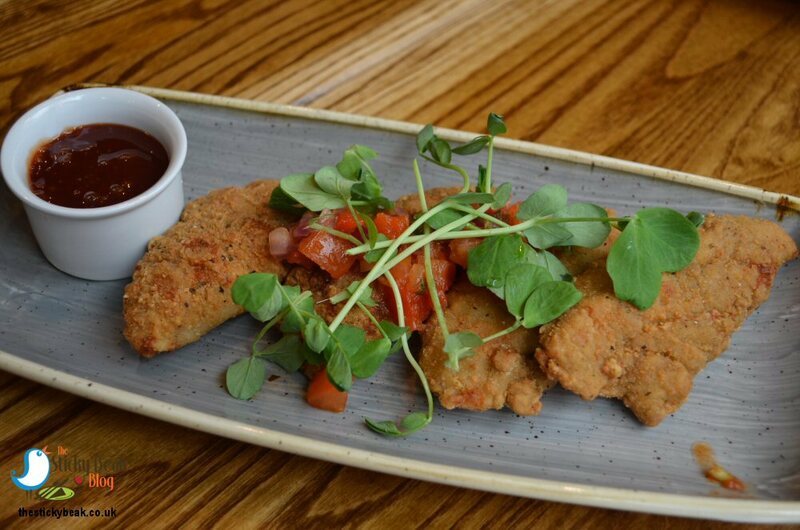 The goujons were accompanied by a wonderfully tangy BBQ sauce and fresh Tomato salsa that gave a difference of temperature in the mouth to keep the senses on full alert. Check backs were made by our server and he was jolly happy to take away two clean plates. The Man bird was impressed with the size of his smothered Chicken – the breast was very ample. 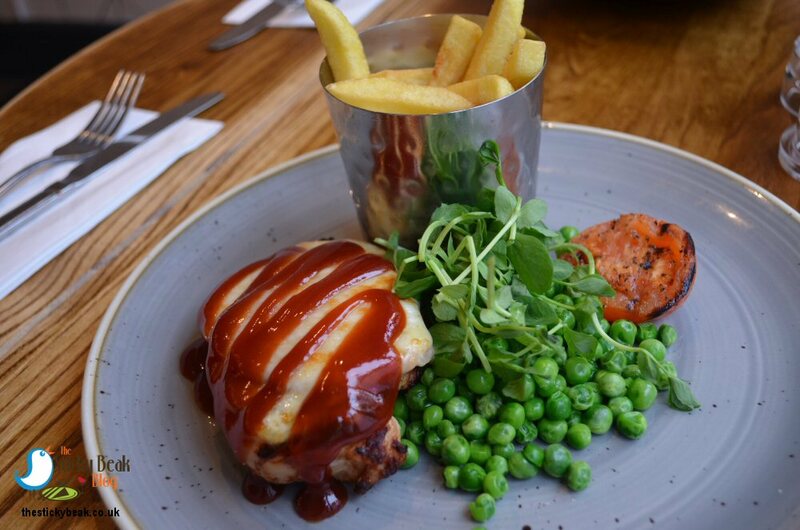 A good thick slice of juicy back bacon lay on top of the chicken and then the whole lot is covered in a blanket of Cheddar and Mozzarella cheese, and BBQ sauce. Once it’s been cooked in the oven, the result is a delicious smelling dish that really gets your nose twitching, and the melted cheese oozing everywhere makes you drool. There was certainly plenty of everything to tuck into, including the accompanying peas, grilled tomato and chips. He did manage to finish the meal, but it took some doing. We gave it a little while before deciding whether or not to have pudding, eventually deciding “in for a penny, in for a pound”. The Sweet and Petite range desserts are all priced at £2.99, but you can pick three for £7 which is what The Boy Wonder and I did. Sour Cherry and Pistachio bites, Elderflower mousse, and mini Chocolate Orange fondants were our trio of choice. 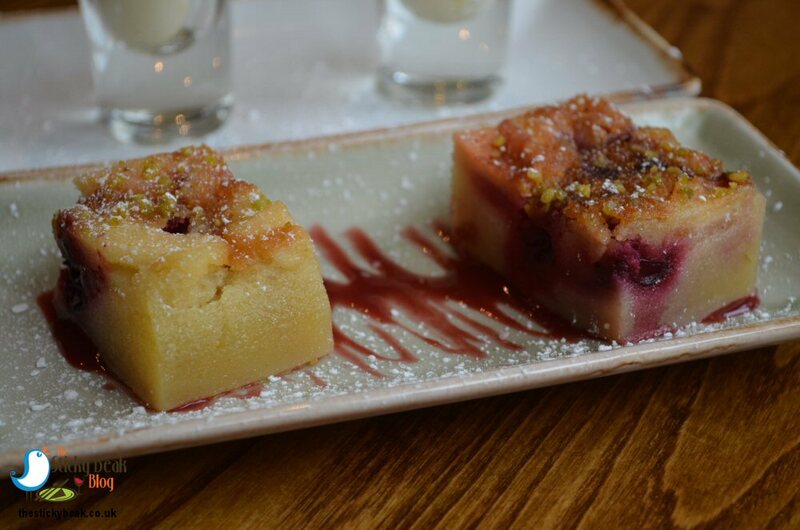 The Sour Cherry and Pistachio bites were super; the lovely tart cherry pieces were encased in a very moist, Almond sponge and dusted with finely chopped Pistachios. In the mouth they had a wonderful effect; the crunch from the nuts, the moist gooey sponge, and tart Cherry really had the taste buds in a tizzy. 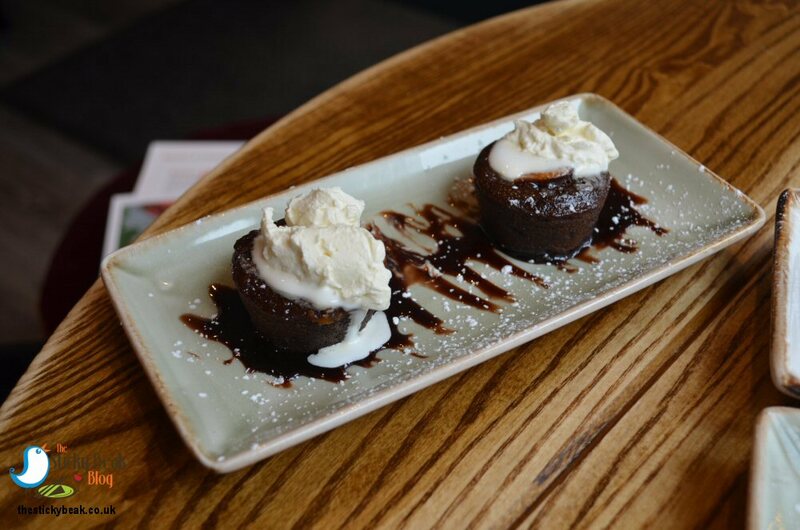 We were expecting something truly indulgent from the Chocolate Orange fondants, and we weren’t disappointed. The dark chocolate was rich and satisfying, and contrasted nicely with the bright citrus note of the Orange sauce on top. Somehow it managed to be very decadent and rich, without being cloying. To round things up we’d left the Elderflower mousse until last, figuring it would be light and refreshing on the palate. It was a superbly light mousse that had the delicately fragrant Elderflower flavour running nicely through it. We had to get creative to get every last bit of it out though! 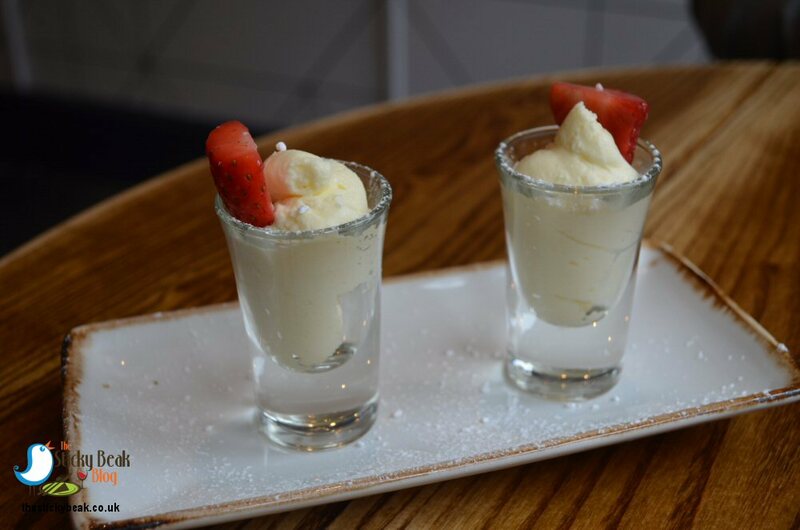 This pud is served in a shot glass, which looks very pretty, but the spoon won’t go all the way down to the bottom –and there’s no way we were leaving any of this in the glass. A quick flick of the wrist turned the spoon upside down and the thin handle got every last bit out - you can’t beat the beak! 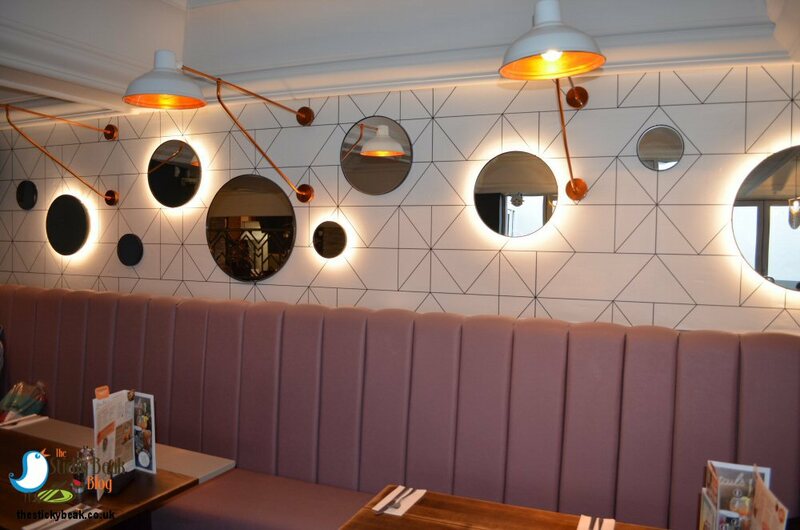 Throughout our visit we couldn’t fault the quality of food or the service we received from the staff, so I can honestly say that it’s worth paying a visit to. 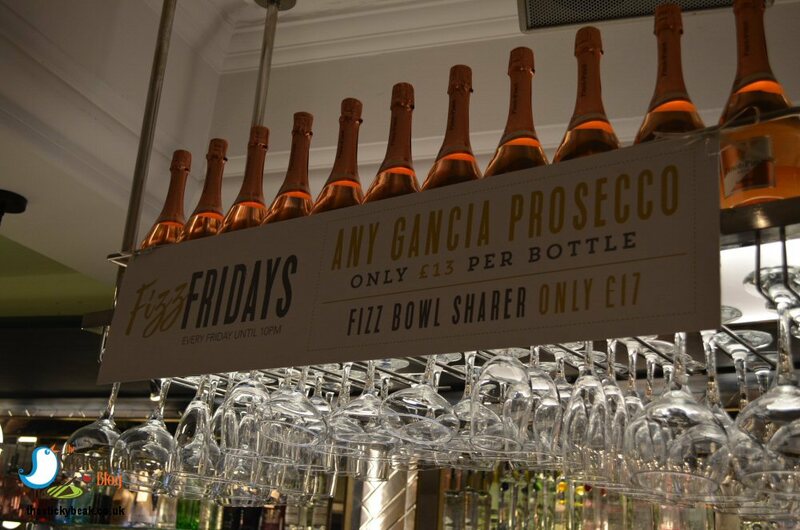 There are offers on every day of the week, including the one we took advantage of (2-4-1 cocktails on same type cocktails); others include 2-4-1 Tanqueray and Tonic on Thursdays, and Fizz Fridays that allow you to get a bottle of Gancia dry Prosecco for £13 or indulge in a fizz bowl sharer for £17. 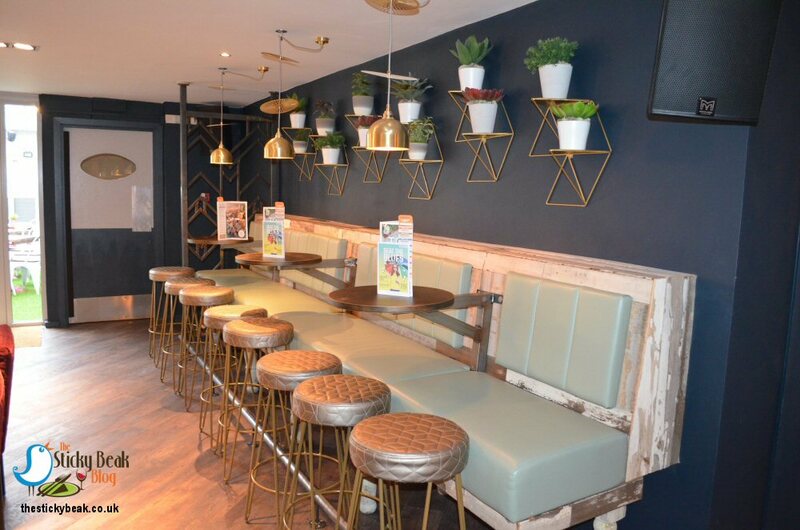 The bar will be open until 2am on Fridays and Saturdays for those really looking to make the most of their night, and the “we are live” payday weekend events and parties on the first Friday and Saturdays in the month will further enhance this venues “party people” appeal.